Your Liberty five dollar gold coin value is at least $316 each. With almost a quarter of an ounce of gold in your coin. It forms a very high base price. It's just the beginning because the value of gold is only one of a few factors affecting the worth of your coin. The first is the date and mintmark. There are many scarce and rare dates scattered throughout this popular gold coin series. The value chart pinpoints these rare dates separating them from the common. So what is the most difficult value factor to get right? An accurate assessment of the condition of your coin, know as "Grading." It affects your Liberty five dollar gold coin value in subtle but major ways. For example, the Liberty $5 gold coin pictured is rare because of its "Uncirculated" condition. This coin is easily worth over $393 . How to grade gold coins is covered in more detail below. It is clear from the value chart, depending on the date, mintmark, and how well your coin is preserved the value can fluctuate from a few hundred dollars up into the thousands. 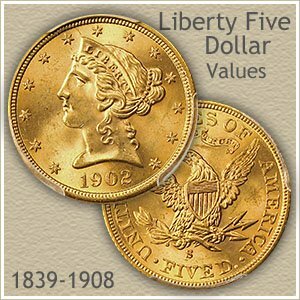 The above are the Liberty five dollar gold coin value. Computed from dealer's price lists and auction results with various mark-up factors figured in. They reflect closely the value you would expect to receive when selling. Variations in value do occur subject to subtle grading points, collector demands and dealer needs. If your coin is not listed above, it is seldom encountered. For additional reference... NumisMedia publishes an extensive fair market value price guide, covering retail Liberty 2.5 dollar gold coin values in detail. The value chart shows all gold coins are scarce and many are rare. The fact is few have survived until today. It is also striking how easy it is to underestimate their value. Especially the coins in better condition. Should you determine your coin is a common date don't stop there. The next chance for enhanced Liberty five dollar gold coin value is the condition of the coin. Compare you coins to the "grading" image below. Find the nearest match. Use the grade to find the highest value on the chart. Examine closely the hair detail. Evidence of wear appears here first. The "About Uncirculated" coin shows the slightest touch of friction on the high points of the cheek and hair. The "extremely fine" grade has seen more action and shows the result. Worn details and less collector appeal. The most sought after coins are "uncirculated" examples. If you feel any of your coins are close to uncirculated, have them evaluated. Because of the rarity, high value and expertise involved most gold coins are sent to a grading service. Collectors and dealers consider PCGS and NGC as leaders in coin grading services. Seek their advice. They both authenticate and grade your coin. The small fee you pay provides assurance you understand and receive the full value of your coin. By touring other sites, you find, most rare coin dealers include the NGC or PCGS assigned grade in their listings. Follow their lead. 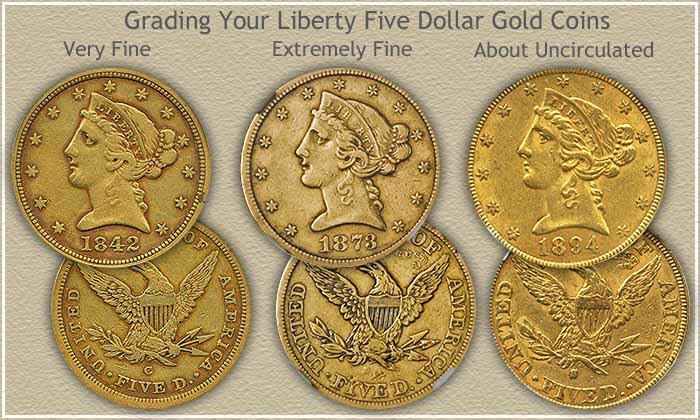 Your Liberty five dollar gold coin value is secure knowing the accurate grade. Mint marks indicate the branch mint that produced the coin. Liberty five dollar gold coins have a long history with seven different mints involved. Except for the Philadelphia mint all placed a "mintmark" on the coins they produced. It is well worth your time locating any mintmark on your coins. Often they carry a premium. One example highly sought by collectors is the "CC" mintmark indicating the Carson City, Nevada mint. Their low mintages and scarcity today makes finding one a challenge. Depending on need, the number of coins produced varied greatly from year to year and from mint to mint. 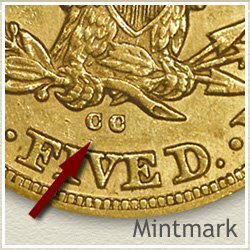 Find the mintmark on the reverse of your Liberty five dollar gold coin just below the eagle. Following is a list of mints and their marks. The Liberty five dollar gold coin value is a direct result of collector demand. These coins are popular today but not hugely so. It is a long running series covering many years. To complete a collection is well beyond the reach of most collectors. As a result, truly scarce coins with small surviving numbers are affordable today. If Liberty five gold experiences any increase in demand values would certainly climb higher. What to do? You have the beginnings of a valuable collection. All old gold coins are scarce, perhaps build a collection. If that is not for you, one approach is to sell all your coins and buy one truly nice rare coin. One you and your children could admire. One to pass down to the kids. Don't be in a hurry to decide. Your Liberty five dollar gold coin value is stable. Handle your coins gently and by the edges to help preserve them. 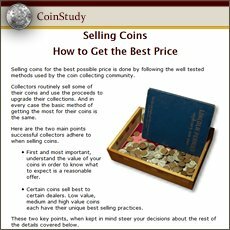 Continue your coin value discovery. Values listed for the One - $2.5 - Five - Ten and Twenty dollar gold coins. With the rise in price of gold all have increased in value. All old US coin values. The home page is an excellent index, quickly leading to the major coin series. From Cents to Gold. Print the Coin Values Worksheet - link in navigation column - to list your Liberty five dollar gold coins and record their values. Should you decide to sell... use the worksheet as an invoice and packing slip when sending coins through the mail to dealers. It indicates you have done your coin values homework.